Even as kids, everyone knew that he was going to be a great athlete. He was not taller or stronger than everyone else, as many of the premiere athletes are when they are young. Instead, he was just faster. When he came up for kickball, everyone moved way back. Then he would kick it over our heads. Or, he would kick it down one of the lines and use his speed for an inside-the-park home run. For seven straight years in elementary school, he was the first pick at recess in every sport. He earned it every time. I was able to witness it for over nine straight years. In sixth grade, our school flag-football team won the Fresno Northwest-area league championship. He lined up at quarterback most of the time. On occasion, he would also line up at running back and wide receiver. He also returned all kicks. Sound familiar? The only time that he did not score a touchdown is when he did not have the ball. Or, when he spun to get out of a tight situation. Spins were not allowed. That year we did not win the Fresno basketball championship. It was fine, because in the spring we won the softball championship. Every elementary school in Fresno participated. In seventh grade we had noon-time sports. Each homeroom sent out a soccer team to play on different days. My team made it into the championship. So did his. The game ended in a tie. But, since it was a championship, we had to go to penalty kicks. He had never played goalie, but his team sent him up. I remember this part vividly, mostly because it was incredible. I took my shot and it went upper 90. More specifically in laymanâ€™s terms, it meant the top corner of the goal. He blocked it. He dived up and to his left and blocked it. There went my glory. And the most prestigious of middle-school awards, the noon-time sports soccer trophy. Iâ€™ve heard that some of the best athletes were smaller growing up. Since they were smaller, they had to work that much harder to succeed. Then, when their growth plates woke up, they have better athleticism than their teammates. Granted, he doesnâ€™t play baseball. He plays football. For Fresno State. Or, more precisely, he used to. He was named by his team as the MVP for this past year. He did it all. Quarterback, wide receiver, running back and special-teams extraordinaire. The NFL lists LaDainian Tomlinson and Pacman Jones at 5-10. Heâ€™s listed by Fresno State at 5-foot-8, which might be a little short. There will definitely be an outlet for football for him. It might not immediately be the NFL. But hey, NFL Super Bowl champion and MVP Kurt Warner started out in arena football. Hey, if Trent Dilfer can win a Super Bowl, anythingâ€™s possible. Remember his name. Clifton Smith. Actually, youâ€™ll probably be hearing it again. It might not be tomorrow or the next day. But keep the name in the back of your mind. 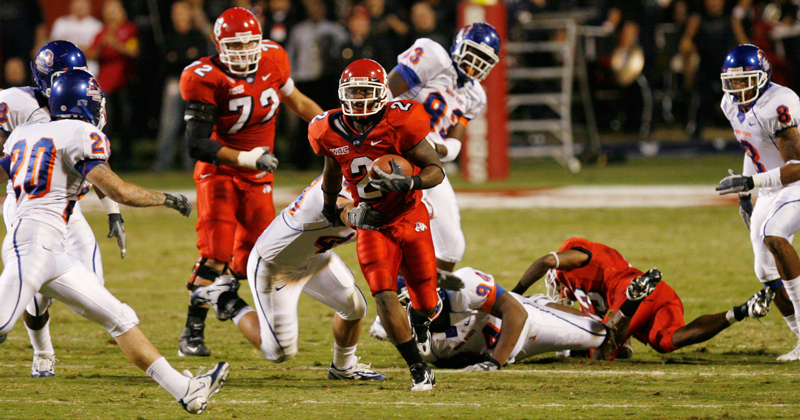 Then when you hear it again you can remember the time when he returned his first punt for a touchdown as a Bulldog. And then another one. 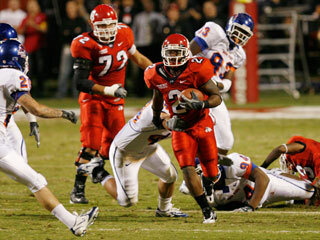 And then another, all the way until he was the top punt returner in Fresno State history. Iâ€™ll remember getting beat every day at recess.